Sunset Carson got no respect in the comic book field. No publisher adapted Sunset into comic form during his glory years at Republic. When he finally did make it to the printed page it was at fourth rate Charlton (always with very bad artwork) and then it was April 1950—even after his Yucca series had run its gratefully quick course. 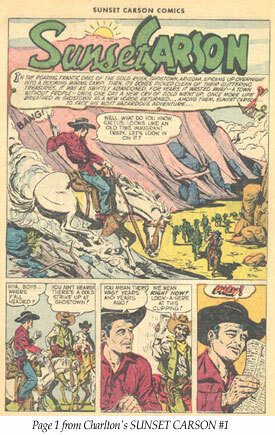 Sunset first appeared in COWBOY WESTERN #27 with a photo cover. 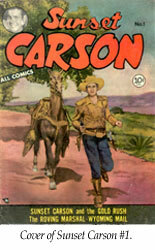 This issue adapted “Sunset Carson Rides Again” into comic form, along with one other story. #28 (6/50) was a drawn cover with both “Battling Marshal” and “Fighting Mustang” adapted. #29 (10/50), with a drawn cover, adapted “Rio Grande” and briefly told Carson’s life story. #30 (12/50) had a fabulous photo cover (from his Republic years), adapted “Deadline” and ran another story. Sunset didn’t return til #35 (10/51), 36 (12/51) and 37 (1/52), all with two stories each. SUNSET CARSON #1, also from Charlton, was published in Feb. ‘51 with a photo cover. #2, 3, 4 also came out in ‘51. All had two Sunset Carson stories except #4 which had four—all by different artists. The only Carson artists proud enough to sign their work were Keats Petree and Fran Matera. Most of the Charlton artists assigned to draw Sunset were real hacks with no one really capturing his likeness. True to Sunset’s films, his horse was named Cactus. Even with the bad art, expect to pay a hefty price for Sunset’s comics due to their scarcity. Copies of COWBOY WESTERN range from $35-$60 each in Good and as much as $700 NM, if you can find them in that condition. SUNSET CARSON ranges $50-$85 in Good and $500-$700 Near Mint. Even VG copies of any of these will set you back over $100 each. Seems the only respect Sunset gets in the comic field is the high price of his collectible back issues. In 1990 AC Comics released a SUNSET CARSON one shot. With a Republic cover, two color stories and loads of photos, it presented Sunset (and Smiley Burnette) better than Charlton ever had.